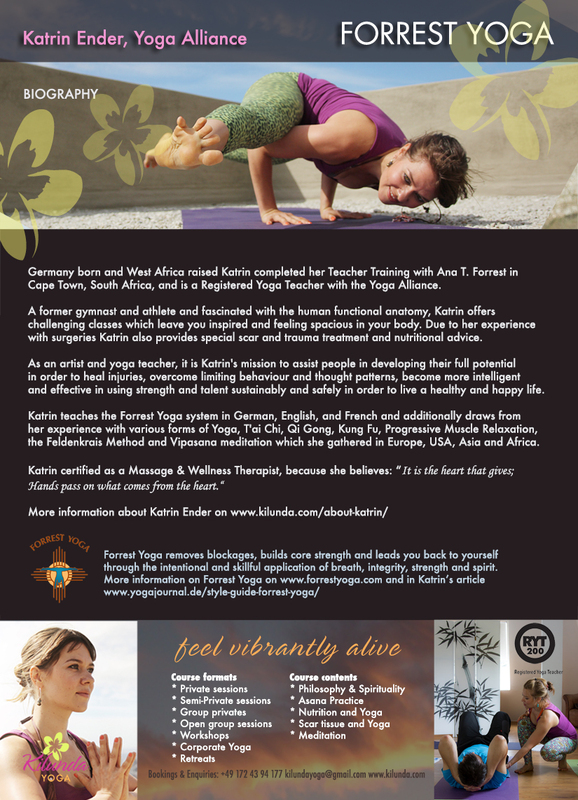 Germany born and West Africa raised Filmmaker, Scuba Diver, Massage & Wellness Therapist, and Yogi Katrin found this being true when working around the world and expanding her spiritual path in Europe, the U.S., Africa, the Middle East and East Asia. “The ability to discern and balance the energies running through your Body is the key to a happy and healthy life.” Able to connect with people of all backgrounds and speaking global truths in four languages (German, English, French and Spanish) Katrin’s passion is to ignite the Spirit and explore the Great Mysteries life beholds. With a Masters Degree in Communication Design & Audiovisual Media Katrin has held significant positions in the film, media, and advertisement industry and has won several awards for her documentary film work. A certified BSAC Sports Diver (Nairobi Sailing and Sub-Aqua Club) and Massage & Wellness Therapist (Terramedus Akademie für Gesundheit) she completed her Foundation Training RYT 200hr in Forrest Yoga with Ana T. Forrest in Cape Town, South Africa. Katrin lived and worked in Taiwan where she studied Kung Fu and T’ai Chi with Master 圖滇南傑 (a.k.a. Derek) who also introduced her to the art of Spinal Adjustment. She met and trained in Rocket Yoga with former Taiwanese Bodybuilding Champion and Yoga Teacher Corey Wu, with whom she shares the physical approach of Strength and Spirit. Aside Yoga, Katrin explored and furthered her experience in Vipasana Meditation, Progressive Muscle Relaxation by Dr. Edmund Jacobson and the Feldenkrais Therapy for deeply relaxing body and mind and training the mind. 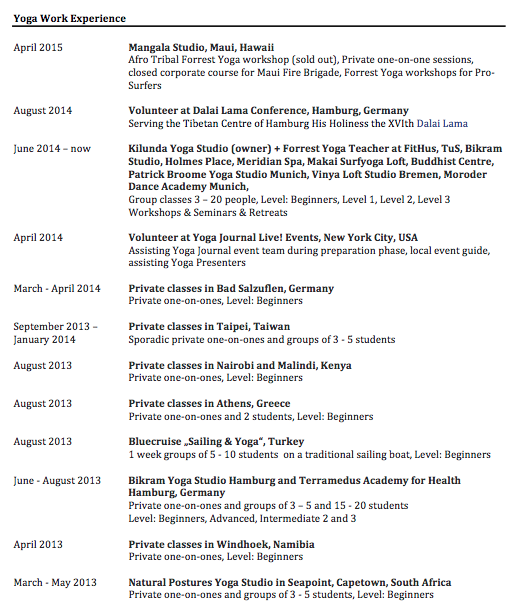 In 2014, she proudly volunteered for His Holiness the XIVth Dalai Lama in Hamburg, Germany. Katrin attended workshops with Sri Dharma Mittra (Dharma Yoga, New York City), Hari Kirin Kaur Khalsa (Kundalini Yoga, Kripalu, Lenox, Massachusets) and Leslie Kaminoff (Yoga Anatomy, New York City), Jason Crandell, Tiffany Cruikshank and studied Ashtanga/Mysore with Yoga Teacher Neil Barker (Pure Yoga, Taipei). She is constantly expanding her knowledge around Functional Anatomy and Yoga as well as scar tissue with Ellen Heed in Los Angeles and at Bob Cooley’s Meridian Stretching Center in Boston, USA. Katrin completed introductory workshops in Ayurveda at Kripalu Center for Yoga and Health in Lenox, Massachusetts and volunteered at Yoga Journal Live! in New York City. 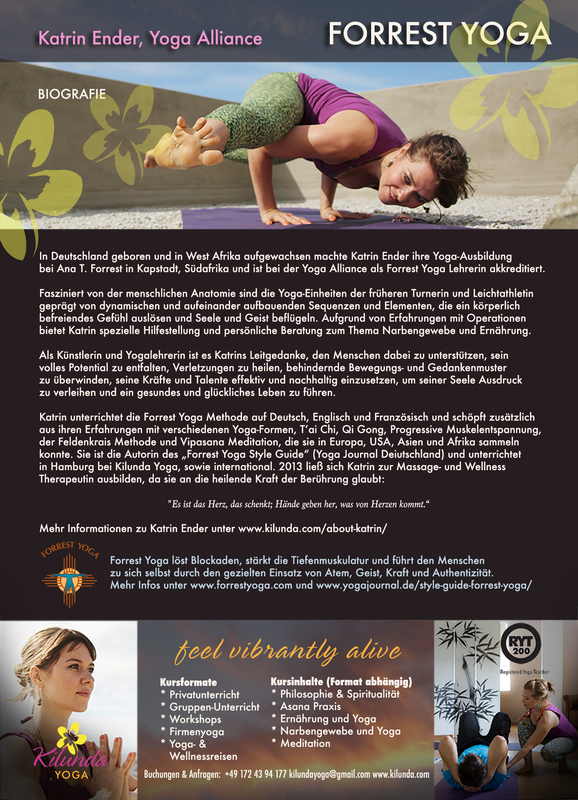 Katrin includes the vastness of her experience into teaching the Forrest Yoga system and philosophy. She strongly believes in the preventative, sustainable, emotionally, spiritually as much as physically strengthening aspects of Forrest Yoga. 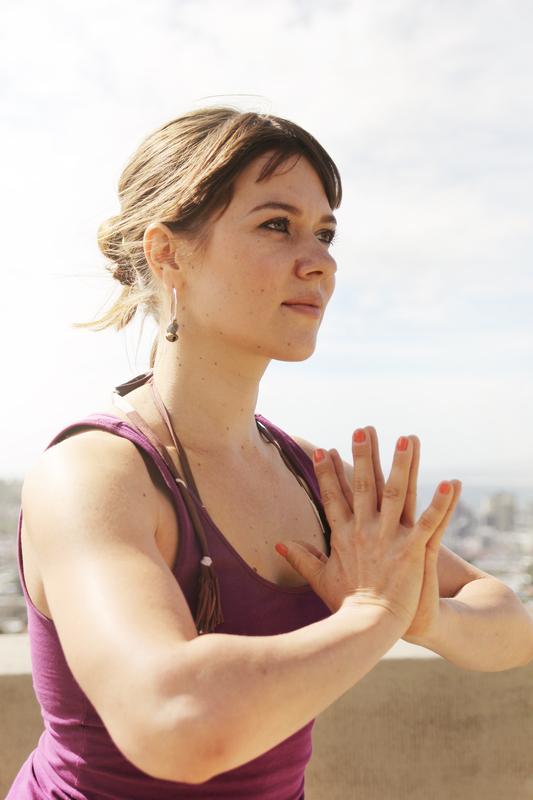 She aims to train with her Teacher and Mentor Ana T. Forrest regularly to deepen her personal practice, keep up to date with the latest developments in Forrest Yoga and further develop her teaching skills. A gymnast and athlete at a young age, Katrin offers dynamic and physically challenging classes that leave you inspired and feeling spacious in your body. With her 10 years experience in the media and film industry she understands the challenges of the corporate world and particularly addresses the needs of career professionals with busy lives. Having undergone several abdominal surgeries, Katrin also provides special scar and trauma assistance. Katrin uses all resources available to her, including Yoga, Ayurveda, Nutrition, and Massage, as well as her Writing, Filmmaking, Art & Creativity and Realizations from her personal Life experience. She believes in her Touch because “It is the Heart that offers, hands pass on what comes from the Heart”.